The flowers of Blue Lotus have narcotic, relaxing and euphoric effects. Blue Lotus was a sacred plant for the ancient Egyptians. This extract is 20 times more concentrated than dried Blue Lotus flowers. Also called Ancient Egyptian Dream Flower as it induces lucid dreaming. Contains 1 gram Blue Lotus Extract 20x. In sealed plastic packaging. Blue Lotus has narcotic, euphoric, and calming relaxing effects. It heightens your awareness: you’ll experience the moment more intensely. The Lotus is used to induce Lucid dreaming, makes you dreams more vivid and controllable. In higher does, mild hallucinations and closed eye visuals can occur! The Blue Lotus or Nymphaea Caerulea flower is known for its lovely smell and finds use as an ingredient for perfume and in aromatherapy. You can use this Blue Lotus extract to brew tea. Use 0.25 gram per person and steep in hot water. Add honey to taste. To consume Blue Lotus like the Ancient Egyptians, soak 0.25 gram of extract in a bottle of wine for a few hours. Don’t use too much! The Blue Lotus will turn the wine bitter and unpleasant to drink. 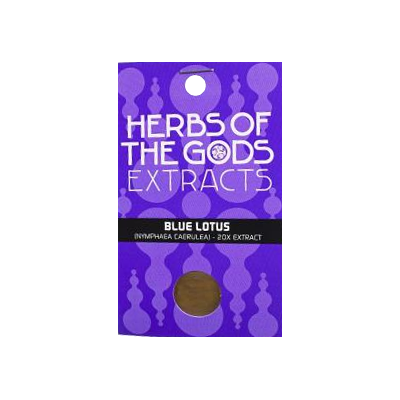 This extract is 20 times more concentrated than regular dried Blue Lotus. The Blue Lotus, or Blue waterlily, scientifically known as Nymphaea Caerulea, originates from the Nile area and other parts of East-Africa. The plant belongs to the water lily family Nymphaeaceae. Blue Lotus was considered a sacred plant by the ancient Egyptians. It is depicted in many stone carvings, paintings, and pyramid temples. It is shown in party scenes, or in connection with ritual dances. The Blue Lotus is central to Egyptian mythology, as it symbolizes the sun. The flower closes its petals during the dark night, and opens up again after the sun rises. There is a story in Heliopolis (“city of the Sun”) that the world originated with Ra (the Sun God) emerging from a lily , and going back in there every night creating the night.